A Colombian beef stew is one of my favorite comfort foods, especially when it’s really cold outside. I already showed you a basic way to make a Colombian style chicken stew, or at least the way I like to make it at home, so if you want, you can use that recipe to make this beef stew as well, sans the chicken. 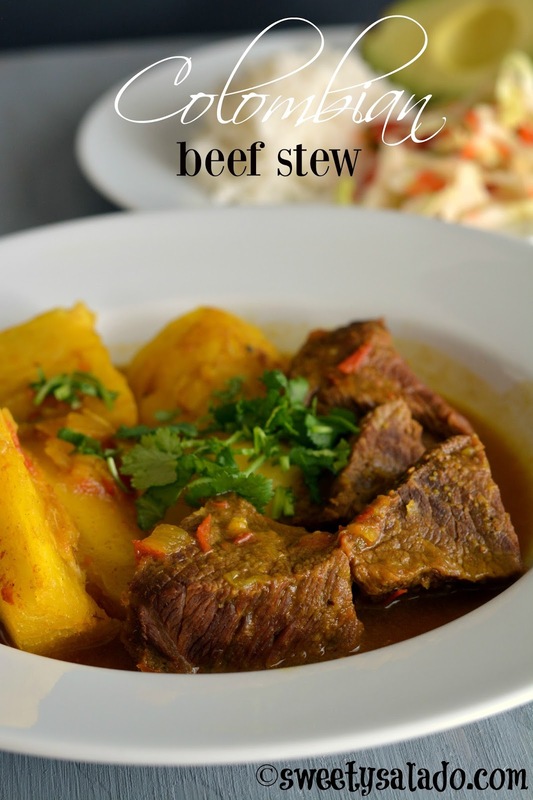 Today, I will show you another way to add that onion and tomato flavor into any kind of Colombian stew because yes, we love stews so much that we also make them with other kinds of meat. If you have followed my blog during these past few years or have seen at least a few of the Colombian recipes I have posted, you will see that Colombians love to cook with onions and tomatoes, so of course, those two ingredients are key for making this recipe. As for the amount of liquid that you need, some people like it really soupy and others like it very dry. I like it somewhere in the middle, not too dry because then you’ll just be eating meat and potatoes with a trace of tomato flavor. But I also don’t like it with too much liquid because it just turns into a soup. I like to have enough liquid to soak the meat and vegetables and I’ll admit it, I also like to add a few spoonfuls on my rice, which is almost always served as a side dish. Another common dish that is served with this recipe is the basic Colombian simple salad. Heat the olive oil in a large pot over medium heat. Add the white onion and cook for about 3 minutes or until translucent. Add the green onion and garlic and cook for 1-2 more minutes. Now, add the chopped tomato and cook for 5-8 minutes or until it softens. Season with the beef bouillon, ground cumin, food coloring, salt and pepper. Add the chunks of beef and water and mix well. Cover the pot, bring to a boil on high heat. Once it's boiling, reduce to medium low and cook for about 45 minutes. 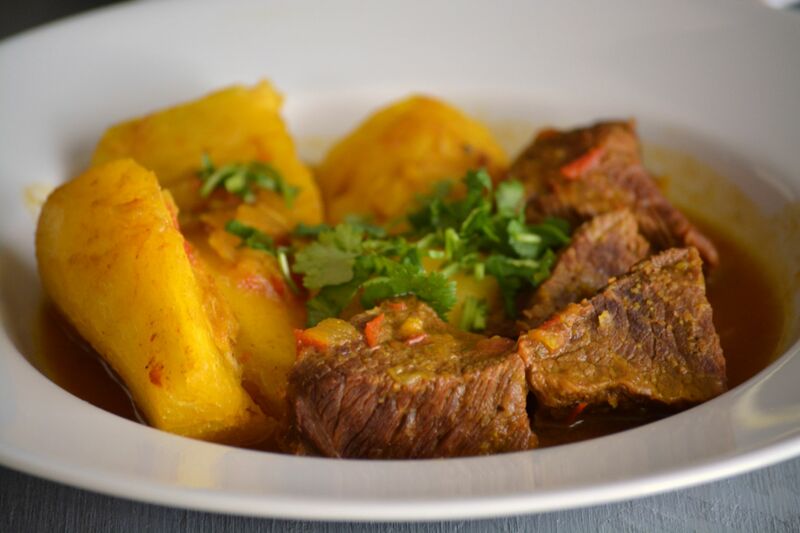 Add the cubes of Colombian aliños, along with the potatoes and cassava. Cover once again and bring to a boil on high heat. Once it's boiling, reduce to medium low and cook for about 30 minutes or until the potatoes and cassava are cooked through. Taste for seasoning and add more salt if you think it needs it. Serve this stew with a side of white rice, avocado and a delicious Colombian simple salad. I have been looking for a healthier stew than what my go to recipe is. It's good, but only "semi" homemade. Your recipe sounds perfect! Looking forward to trying it. Great recipe! Tastes delicious and is very close to what our family serves when we are in Bogota. So glad to find your website!